In chemistry, a catalyst is a substance that causes a chemical reaction to happen in a different way than it would happen without that catalyst - for example, a catalyst could cause a reaction to happen at a faster rate, or at a lower temperature, than would be possible without the catalyst. When the term catalyst is used outside of chemistry, it refers to something that causes a change or reaction to take place. Hydrogen peroxide will decompose into water and oxygen gas. Two molecules of hydrogen peroxide will produce two molecules of water and one molecule of oxygen. A catalyst of potassium permanganate can be used to speed up this process. Adding potassium permanganate to the hydrogen peroxide will cause a reaction that produces a lot of heat, and water vapor will shoot out. 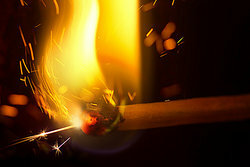 If you light a match in a room with hydrogen gas and oxygen gas, there will be an explosion and most of the hydrogen and oxygen will combine to create water molecules. Jennifer and Jason met in Mrs. Harrison's 1st grade class. They were friends all through grade school, high school, and college. Their friends and family members all thought that they should date, but they never did, and the people around them began to get impatient. Finally their friends Sarah and Matt took the matter into their own hands. Sarah asked Jennifer to go a concert with her, and Matt asked Jason to go to the same concert with him. At the last minute Sarah and Matt cancelled, leaving Jennifer and Jason to attend the concert together. They began dating and later got married. Sarah and Matt were the catalysts in bringing about Jennifer and Jason's relationship. The West High School girls basketball team was behind in the playoff game with a score of 51-45, and the players were losing steam. With two minutes left in the game, the coach put in the substitute point guard, Ella. Ella was fresh with energy and just what the team needed. She scored two baskets within the first minute, sparking energy in her teammates. West High rallied and won the game 52-51. Ella was the catalyst that caused her team to win. Three people have assembled to prepare envelopes for a mailing. One person is folding the letters; another person is stuffing the letters into the envelopes; and the third person is sealing and stamping the envelopes. Before long, the third person has a stack of a letters piled up in front of him; he can't keep up with the other two because he is doing two jobs rather than one. A fourth person joins the group late and helps with the stamping and sealing backlog, and then takes over the stamping. This allows the third person to catch up, and serves as a catalyst for the group to get the job done faster. These examples of catalysts show how one action or one person, both in chemistry and in life, can be the catalyst for change. "Examples of Catalysts." YourDictionary, n.d. Web. 18 April 2019. <https://examples.yourdictionary.com/examples-of-catalysts.html>. In chemistry, a catalyst is a substance that causes a chemical reaction to happen in a different way than it would happen without that catalyst – for example, a catalyst could cause a reaction to happen at a faster rate, or at a lower temperature, than would be possible without the catalyst.When the term catalyst is used outside of chemistry, it refers to something that causes a change or reaction to take place.